Colorado, we’ve taken notice, is a huge fan of local edibles producer Sweet Grass Kitchen. From their powerhouse owner and operator Julie Berliner, to their dedicated staff, to their craftily curated Instagram gallery. SGK is an outstanding example of a trustworthy and responsible marijuana infused product producer. If you’re lucky enough to tour the SGK facility like I was, you’ll see smiles all around. It’s a tight knit group – I met marketing, sales, baking, packaging and growing on my short tour around the building. I was mightily impressed with the easy going flow between departments, not every workplace has that kind of vibe. And then I met my pies. 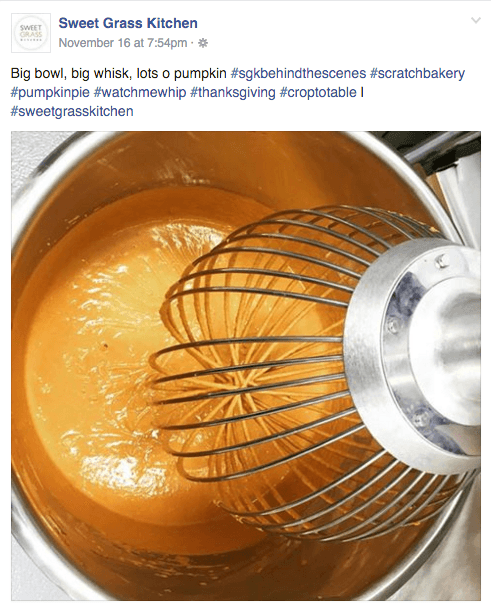 It was a Sweet Grass Kitchen first for me – I’ve never had the pleasure of trying the brand until now. After shaking hands and hugs goodbye it was time to head home and see if these pumpkin treats lived up to the hype. After cutting open the package and quickly inspecting my first pumpkin pie (10 mg, recreational dose) I, admittedly, scarfed it down. I was expecting the usual “weedy” flavor but instead I just got the warmth that pumpkin pie intends – with hints of cinnamon that left me wishing I had more. And I did! I ate a second pie – I have a predetermined HIGH tolerance for edibles – and waited for the magic. Sure enough, two hours or so later, I was lying on the couch eating a post dinner bowl of cereal and watching the new series with David Cross and Bob Odenkirk. It was obvious to me then that the pies were in full force – which was A-Okay with me. I made it to bed before 10:30 and slept solid for nearly 8 hours that night. Sweet Grass Kitchen’s pumpkin pies are an absolute A+ in our book. They’d be great as an adult after dinner treat on Thanksgiving or as a medicated snack on a fall hike. Recreational cannabis laws in Colorado can be tricky to understand so we broke it down into this awesomely simple infographic! First some background. Colorado and Washington were the front runners of the recreation legalization movement in the United States. In 2102 with the passing of Amenment 64, adults over the age of 21 in the great state of Colorado can legally possess up to one ounce of marijuana. So rule number one in Colorado is that you must be 21 years of age or older or you can not legally toke up. You must possess a government-issued identification to prove you are 21 years or older in the form of a passport or drivers license. There you have it. Simple graphic you can review before your next trip to Colorado. Remember while your in Denver to book “the original Colorado Cannabis Tour” and as well as your 420 friendly hotels, and activities. Next we will be featuring Oregon and Washington as well as the Colorado laws and rules for cannabis consumption in hotels, cars, and public.